Magnetic resonance imaging (MRI) is a noninvasive imaging technique with an extensive range of applications in biomedical diagnostic imaging. 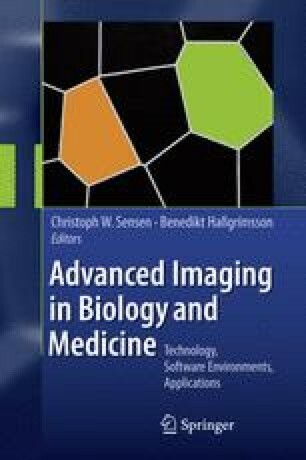 This chapter reviews selected aspects of advanced experimental MRI with a focus on brain imaging using animal MRI systems and their application to improving understanding of the pathophysiology of the brain. Anatomical MRI is advancing diagnostic applications through the increased use of quantitative morphology and MR relaxation times. Microscopic imaging is progressing with improvements in spatial resolution. Diffusion MRI imaging continues to enhance the information it provides on tissue and cellular or axonal structure using diffusion tensor imaging and diffusion tensor tractography. Magnetization transfer imaging is also providing supplementary information on pathophysiological changes in tissue, particularly white matter. Functional MRI in animals in conjunction with other invasive methods has improved our understanding of the fMRI response. Molecular MRI is a rapidly growing field that holds promise for the noninvasive imaging of molecular cellular processes using targeted or responsive contrast agents.